Stacks let you reuse a block or a combination of blocks in multiple places on your site. From this Dashboard page you can manage all the stacks you have permission to access. 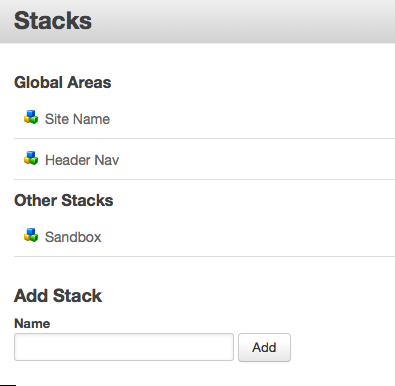 The Global Areas Stacks are the stacks that appear on every page of your site. The Other Stacks were created by users. When you add a Stack it will be added in the Other Stacks. You can manage a Stack by clicking on it. An overlay with the Manage Stack options will open. Placing the stack in move mode will also open an overlay with the Manage Stack options called “Editors contents”. Each block will have a red dotted line around it. Now you can drag and drop your blocks around. After you move a block or add a block, you will have the option to Approve Changes to your stack. You can also take a look at the Version History of your stack. If your not familiar with Versions you may want to review the Versions section of the Editor’s Guide.